An animal shelter has launched an appeal to help find a man who set a dog on fire at a park in Virginia. 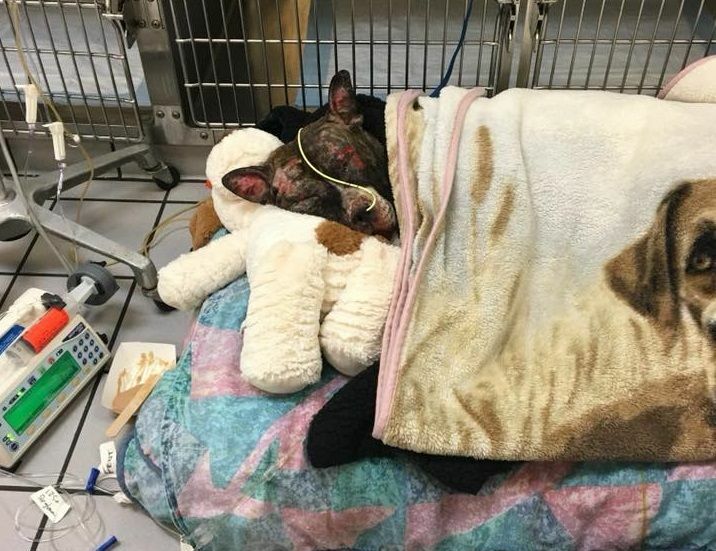 The Richmond Animal Care and Control (RACC) said the male brindle pit bull was found tied to a pole in Abner Clay Park after being covered in accelerant and set alight on February 10. “We don't get rattled by much at RACC, and have witnessed many ugly cases, but this one makes us want to just sit on the floor and cry,” the shelter said in a statement. Christie Chipps Peters, of the RACC, told WWBT how firefighters “literally opened their bay doors and saw him on fire and ran across the street” to save the dog. In a follow-up statement, the RACC said Tommie is now in a stable condition having being treated at Virginia Veterinary Centers and that he wants to say thank you to everyone for the "love and support” he has received. Eyewitnesses reported seeing a man wearing “multiple layers of pants” run from the scene toward Belvidere Street after setting the dog alight, according to the RACC. “ANY information, anything you saw, anyone you suspect, if you have ever seen this dog, please call or message it in—no information is insignificant. We want to find the person responsible for this heinous crime,” the RACC said. Tony Rolando, a local resident who owns two pit bulls, said he is hopeful that the culprit will be caught. “They’re bad people in the world. They do bad things, but with social media and how knowledge can be passed along quickly, they’re the ones that need to be worried,” Rolando told the Richmond-Times Dispatch. Anyone with any information about this crime should call Metro Richmond Crime Stoppers at 780-1000 or submit their tip through 3PTips.